Specialized Training for insurance and law enforcement investigators. The only training center of its kind in North America for the specialized training of Property/Casualty and Healthcare Fraud investigators. Dr. Rick Wakefield JD, DC, PA, nationally recognized leader in the training of SIU investigators, Medical management nurses, and BI adjusters for the insurance industry, has added the development of on-line courses to the academy's on-site courses. IHC Academy is a hands-on training program conducted in an "environment of relevance" located in Marietta Georgia. Participate in Clinic inspections (conducted in our mock-up clinic), preparing cases for prosecution, get practical experience with actual cases, understanding CPT and HCPCS codes in investigations, and participate in live demonstrations of physical exams and the hands-on use of therapy equipment. Each course consists of three days of comprehensive education on the investigation of conditions normally seen in the Property/Casualty and Healthcare insurance industries. All courses lead to certification by IHC Academy. 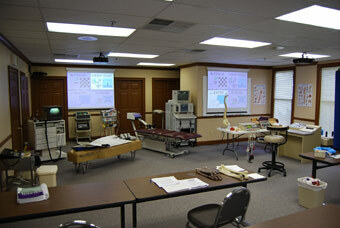 Our new classroom and clinic facility has been completed and being used for classes. Copyright © 2014 International Healthcare Consultants, Inc. All Rights Reserved.